Foster a grateful attitude and embrace the blessings in your life. 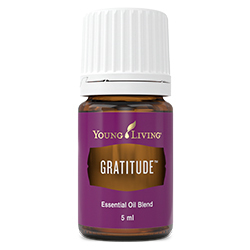 The uplifting aroma of Gratitude™ invites a feeling of emotional and spiritual progress. This wonderful, empowering essential oil blend was designed to quieten down, soothe, and elevate the mind while bringing relaxation to the body. Apply to crown of head, ears, wrists, neck, feet, or over heart to help foster a thankful heart. Diffuse to promote feelings of gratitude, thankfulness, and appreciation. Add to V-6™ Enhanced Vegetable Oil Complex and use in a full-body massage to assist with spiritual grounding and emotional balance. Complementary essential oil blends include: Grounding and Hope. Balsam Canada (Abies balsamea) needle oil †, Frankincense (Boswellia carterii) oil †, Coriander (Coriandrum sativum) seed oil †, Myrrh (Commiphora myrrha) oil †, Ylang ylang (Cananga odorata) flower oil †, Furocoumarin-free bergamot (Citrus aurantium bergamia) peel oil †, Northern Lights Black Spruce (Picea mariana) leaf oil †, Vetiver (Vetiveria zizanoides) root oil †, Geranium (Pelargonium graveolens) flower oil †.